Charles Lewis Meryon is best known as Lady Hester Stanhope's long-suffering physician and biographer. He published her memoirs in the 1840s, several years after her death, despite the severe invective Lady Hester had unleashed in those conversations against many well-known politicians and personages. 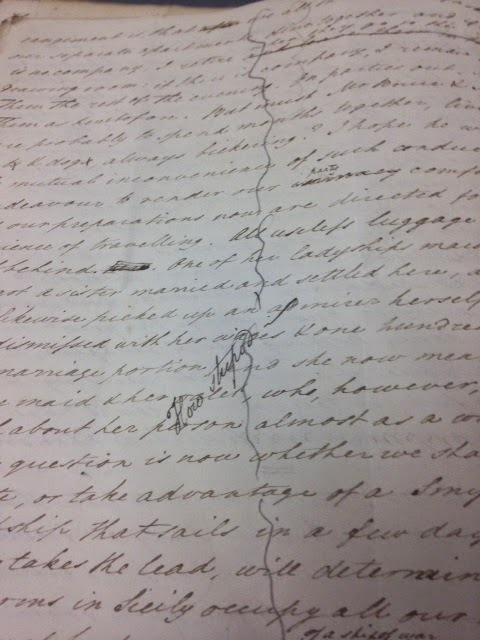 Later, in 1861, Meryon went through his papers again, and he took the liberty of scratching out quite a few of his old notes on Lady Hester. In the 21st century, hardly anything survives in public archives relating to his time with his illustrious patient. Nevertheless, in my research on the mysterious connection between the 'maid,' 'secretary,' and 'female companion' Elizabeth Williams to both William Pitt and Lady Hester Stanhope, I have increasingly come across written evidence which suggests that there is more to it than meets the eye. Elizabeth Williams stayed on with Lady Hester Stanhope following Pitt's death, and moved with her to Montagu Square in London. Later, she travelled with Lady Hester in seclusion to Wales, and in 1810, they both left England permanently for the Mediterranean and Middle East. Elizabeth's younger sister Louisa Jane had married a Mr. David, and permanently moved to Malta in 1807. Fittingly, Malta was the first port of call for Lady Hester, Miss Williams, and Dr. Meryon. After spending a little while there, Lady Hester decided to leave Malta - and Miss Williams - behind. Meryon often had his post directed to "Mr. David's Bread commissary at Malta,"  so it would not have been out of the ordinary for him to request his clothing to also be safeguarded with the David family. Knowing the great interest you take in Lady Hester’s health & welfare it would be unpardonable in me if I did not seize the first opportunity to communicate to you a recent illness which she has suffered, and which will no doubt be represented in a variety of ways at Malta. A little more than a fortnight ago she was attacked with an inflammatory fever, which affected both her brain & her chest rendering her for six nights delirious [to that degree that she was at once delirious and almost incapable of…never since I have had the honour of being]…Her life was despaired of, and I scarcely thought I should have the pleasure of writing to you the consulting news I now am able to send you. For after the most imminent danger two days, the fever left her, and though she remained in a state of debility the greatest you can conceive yet since that day her health has mended and our fears for her life are entirely over. Still, however, the greatest attention is required as the smallest error in diet or medicine throws us back, and the strictest regimen & attention only brings her on slowly. In about a fortnight I hope she will be able to set out for the foot of Mt Lebanon near Sayda where she has fixed to remain for the winter. Lady H. laments much to find that in all your letters you manifest a peevishness & discontentedness with your situation at Malta. You do wrong, for there is not a moment that she does not speak of you with the same tenderness & affection as if you were her child. If you dislike Malta you can go to England, where you will be sure to find a respectable service, and there are your friends Mr. Rice, Wilson, & Pocknell where you always are sure of an asylum. As for your complaints that she does not write to you, she desires me to say you should consider that half the letters that are sent are lost on the way & they never reach you - and besides, you know, there is another Miss Williams who gets hold of them & reads them, and thus renders it quite impossible to write with any confidence. As for myself, I hope, Miss Williams, to retain a place in your recollection as ever anxious to render you any service that may lie in my power. I remain, with great sincerity, yours most faithfully, C.L.M. I still have more of Meryon's papers to pour over, but these two surviving letters from 1813, and the unusually close relationship they hint at, suggest there is more to this lurking under the surface. 1. Charles Lewis Meryon's papers. The Wellcome Library. MS 5687, file 1 of 3, f. 30. 3. Charles Lewis Meryon's papers. The Wellcome Library. MS 5688, file 1 of 3. 4. Charles Lewis Meryon's papers. A letter from Meryon to his parents, dated September 30, 1812. The Wellcome Library. MS 5688, file 1 of 3. 5. Charles Lewis Meryon's papers. The Wellcome Library. MS 5688, file 2 of 3, f. 143-144. Figure 1: Meryon's thoughts on Elizabeth Williams's (temporary) dismissal from Lady Hester Stanhope's employment in July 1810 - "How stupid" (my photo of MS 5687, file 1 of 3, f. 30).